The Shetland Islands are at the crossroads of the North Atlantic, lying as close to Norway and Faroe as it is to mainland UK, giving it a unique heritage and culture. The Isles were part of Scandinavia until 1469 and much of this heritage is still evident today, in place names, archaeology, music and folklore. With over 100 islands, Shetland has plenty to explore and the natural landscape is remarkable. There can be no better way to experience first hand the true beauty, nature and elements of this stunning destination than by touring Shetland using the SHETLAND CAMPING BÖD NETWORK. Owned by Shetland Amenity Trust, the Network covers the mainland, and three of the islands accessible by regular passenger ferry. What is a Shetland Bod? A Bod is a traditional building used to house fishermen and their gear during the fishing season. Today, the word has been borrowed to describe basic accommodation for those who want a simple holiday in the islands. Anyone familiar with English camping barns or Scottish Bothies will have a good idea of what to expect. Bods are very basic, some of the remote ones have no electricity while others have the luxury of showers. For all the Bods visitors need to bring their own bedding, eating and cooking utensils. The Bod are all in attractive locations and each has an interesting history connected to the local area. 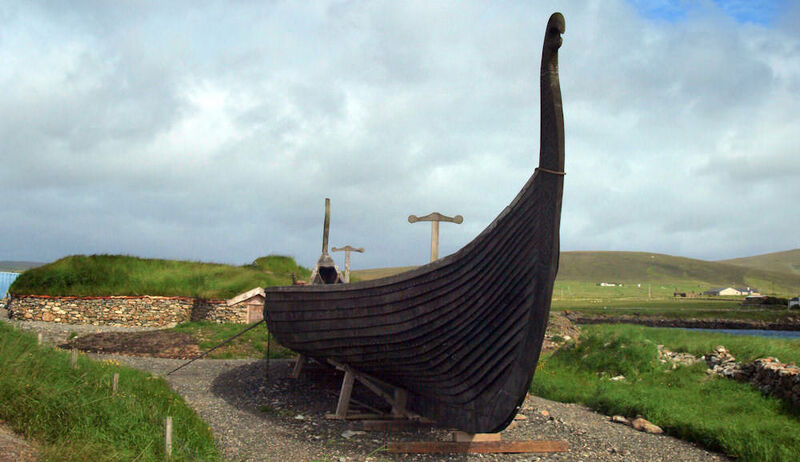 Shetland has a range of attractions, from an excavated iron-age village in the south of the islands to Viking longhouses in the northernmost isles, most of them looked after by the Shetland Amenity Trust. The best place to start your journey into the islands heritage and culture is the Shetland Museum and Archives in the capital town of Lerwick. Here you will discover Shetland’s story, from its geological beginnings to the present day. The displays contain a wealth of treasures, from boats suspended in mid air to a Trowie Knowe – where mystical creatures live! The Museum supports a network of wonderful heritage and cultural sites throughout the isles, which offer a real taste of the islands. These includes local community museums; nature reserves; annual culture and heritage festivals and some of the oldest archaeological sites in Europe. The Amenity Trust also provide ranger guided walks, which take place throughout the summer. From a place to sleep to daytime activities Shetland Amenity Trust provides all you need for a fascinating holiday. Old Scatness Broch & Iron Age Village is a fascinating time capsule where excavations have revealed Pictish and Iron Age villages. To experience live excavations, head to Unst during the summer months to discover more about Viking life alongside archaeologists excavating several longhouse sites. Visit the Shetland Textile Museum at the Bod of Gremista to see exhibitions and examples of Shetland knitwear and textiles. This building is also the birthplace of Arthur Anderson, co-founder of Peninsular and Oriental Stream Navigation Co. The Crofthouse museum offers a chance to step back in time in a typical thatched 19th century Crofthouse, with a warm peat fire, welcoming custodian and restored watermill at the end of the garden. Go to Sumburgh Head to see puffins, whales as well as many other sea birds and seals. From Summer 2014, the new visitor centre at Sumburgh Head, the southernmost tip of mainland Shetland, offers an informative and interactive visitor experience, looking at the history of the Lighthouse, the people who lived and worked there and the archaeology, geology, wartime history and fascinating natural heritage of the area. Shetland’s geology is more diverse than any similar sized area in northern Europe. You can walk across the ocean crust, stroll through the flank of a volcano and visit the best exposure of the Great Glen Fault. It is also rich in wildlife; over a million seabirds inhabit the cliffs, inland the hills and moorland host a variety of breeding birds, such as Red Throated Divers, waders and Skuas. Many rare migratory birds are also recorded annually. Offshore, whales, dolphins and seals are regularly spotted and, for the lucky observer, otters abound. Mid summer sees a riot of colour, with numerous wild flowers in the fields and meadows. Although over 300 miles from Edinburgh, Shetland is easily accessible, with daily flights and car ferries. To really appreciate Sheltand’s unique heritage and culture you must experience it so head north and discover it for yourself. Here you can view a map showing the locations of hostels, bunkhouses and Bods on Shetland and Orkney.